Place of Birth: Hendon, Middlesex, England, U.K.
Place of Death: Goring-on-Thames, Oxfordshire, England, U.K.
George Michael was a British singer, songwriter, record producer, and philanthropist. He was a member of the musical duo Wham!, with Andrew Ridgeley. His father, Kyriacos Panayiotou, was a Greek Cypriot. His mother, Lesley Angold (Harrison), was of English descent. George’s maternal grandfather was George James Harrison (the son of George Albert Harrison and Amy Major). 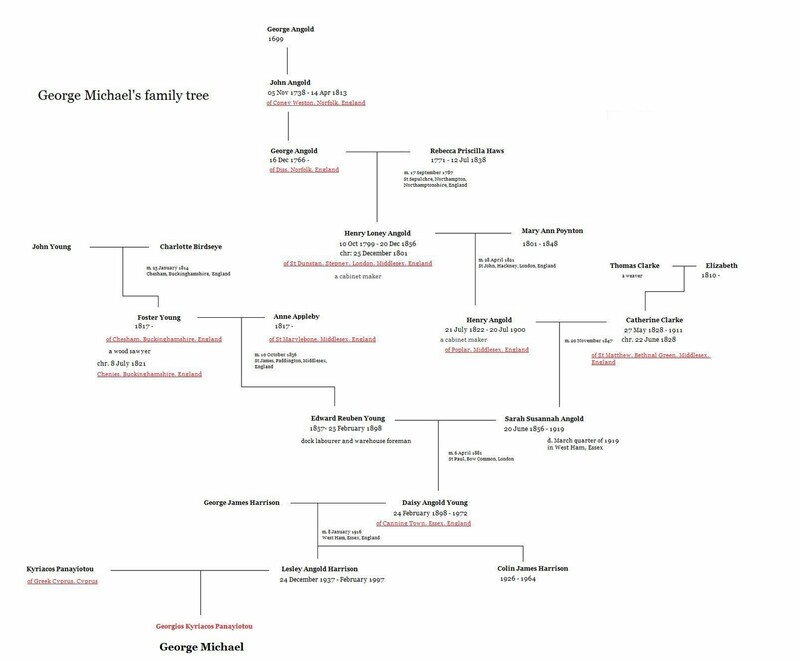 George’s grandfather George was born in Greenwich, London, England. George’s great-grandfather George was the son of George Harrison and Eliza Blacket. Amy was the daughter of Charles Christopher Major and Sarah Richards. George’s maternal grandmother was Daisy Angold Young (the daughter of Edward Reuben Young and Sarah Susannah Angold). Daisy was born in West Ham, Essex, England. Edward was the son of Foster Young and Mary Ann/Anne Appleby. Sarah was the daughter of Henry Angold and Catharine/Catherine Clarke; Catharine was born, c. 1828, in Hackney, Middlesex, England, the daughter of Thomas Clarke and Elizabeth Ann.